The Time Traveler’s Wife, Audrey Niffenegger, Harcourt, 2003, 546 pages. I’m not big on romance novels, so this book did not attract my attention for a long time. Its billing as a love story made me think of fawning girls, juicy kisses, pining hearts and all that other mushy stuff—not anything to hold my interest. Finally, a trusted friend who knows my taste gave me a recommendation, and I was desperate for something escapist to read quickly during vacation. This was a great choice. This book is a lot more than mushy love stuff. It is an amazingly well-crafted intersection of two lives, one of which does not move chronologically. Henry DeTamble is a time traveler, against his will, and his life intersects with Clare Abshire from the time he is twenty years old. However, because of his time travel, those intersections take place from the time Clare is six years old into her adulthood. Because their lives are so intertwined, neither Clare nor Henry hold the entire story of their lives—they each only know parts and pieces, and their partner must forever be helping them by giving them the whole picture. Throughout the novel, I kept comparing their unusual relationship to a more traditional one, and I see connections everywhere. I think all of our relationships, especially those that continue over many years, help us to fill out our memory and understanding of life’s events. J and I have been married for 13 years (tomorrow! ), and we act as mirrors and memories for one another. One of the greatest gifts of marriage is to have a witness to your life. We go through things together, and we see each other change and grow. We remember our younger selves, and hold on to pieces of memory and self for one another. This is not so different from Henry and Clare. The novel itself is a beautiful, intricate construction. Niffenegger somehow manages to assemble all the pieces of their lives—Clare’s chronological movement with Henry’s jumping about—into a cohesive whole. No detail or element of plot is irrelevant or neglected. The author deftly winds up every loose detail into a complete and satisfying story and ending. There is a sense of genius in the construction. Most importantly, though, I just enjoyed reading it. I read the whole thing in 24 hours, and enjoyed every minute of it. I loved all the characters, and wanted to spend more time in their world. It was a great escape novel, with enough to keep the mind churning after turning the last page. 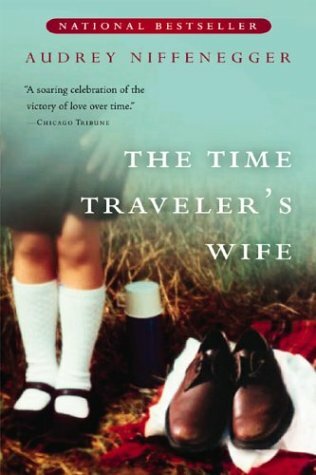 5 Responses to "Book Review: The Time Traveler’s Wife"
So glad you enjoyed it. It’s really a wonderful read. I found that it made me reflect so much on my own non-bizarre (at least chronologically) relationships. I love this line from you: “One of the greatest gifts of marriage is to have a witness to your life. ” So true. We’ll be celebrating 9 years in a few weeks. Congrats to you and J on 13! Thanks! You were the one whose recommendation won me over, and you were right. Happy upcoming 9th anniversary to you both! I’m reading it right now and I just can’t get enough of it. I was with my boyfriend last night and he kept getting upset because I wouldn’t put the darn book down!